Here is the rest of the Red & Black version of my School Spirit Set as requested by Waukeshatony. I'd like to thank LyricLee again for allowing me to recolor her toddler tee's. 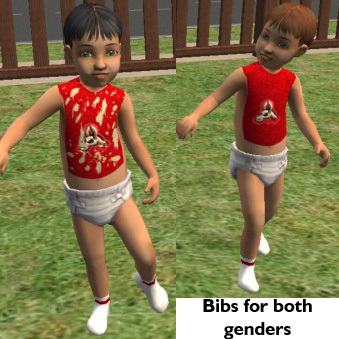 1) The toddler tees appear in the "Everyday", "Undies", and "Pjs" categories for both genders. 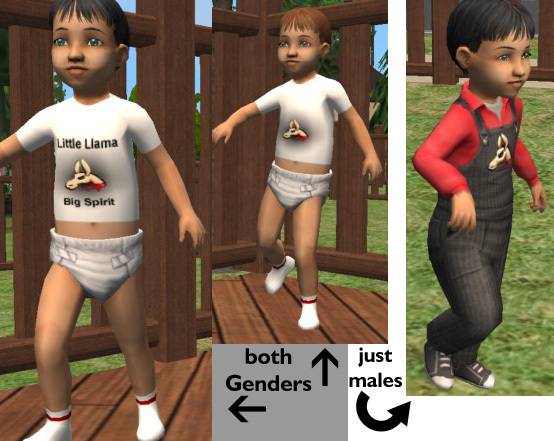 Just like before, they come with and without the words "Little Llama - Big Spirit" on the front (both have the Simlish phrase "Vo Gerbits!" for "Go Llamas!" on the back which can easily be removed in Bodyshop if desired). 2) The "Clean" and "Dirty" bibs only appear in the "Everyday" category for both genders. 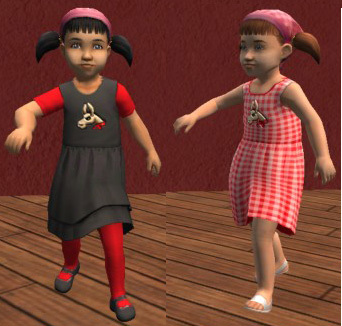 3) The two dresses for the toddler girls and the overalls for toddler boys also appear only in the "Everyday" Category. 4) The face paint is available for all ages and genders. I didn't include a facepaint that had just the llama since there is one in my original School Spirit Set. Once again, I should point out that a Sim's facial structure/features may distort the facepaint; in other words, this probably will not look very good on a Sim with an overally swollen face for example. 5) The sweats appear in both "Everyday" and "Athletic" categories for the Young Adult, Adult, and Elder ages of both genders. 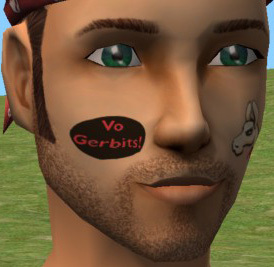 Like before, they come in two versions (with and without "Vo Gerbits!" on the back) and the Elder versions have the faded logo and optional text. These are just recolors, so there aren't any new meshes to download. There should be no Expansion Packs required. It has been a crazy week though, so let me know if there are any problems. 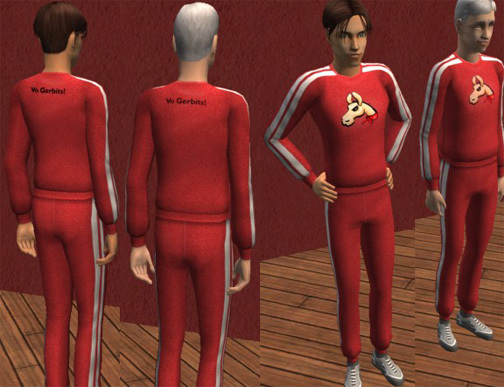 As of June 16, 2006, I had pulled my red version of the male and female school jackets for Young Adult (in the "Everyday" category) as well as the red Young Adult University baseball hat for male and female (all 4 standard colors in the custom hair bin--not the right bins) from this post. I am uncertain if I still have a copy of these files. It may be possible that I would need to remake them should I decide to reinstate them.